Jerry Ruff applies Tim's principles of beautiful organizations to nursing homes. During high school and early adulthood, I periodically stopped up to visit Albert and a handful of other folks at a nursing home near my family’s house. Over the course of those years, I usually found Albert dressed in a nightshirt, typically in bed. He was served meals in bed on a tray. When his meal arrived, Albert would take the cloth napkin from his tray and tuck it firmly into the collar of his nightshirt. After eating, using his one good hand, Albert would remove the napkin, dab his mouth, and then meticulously and perfectly refold the napkin on his tray. I will return to Albert shortly. In his talk, Leberecht describes “four principles to build a beautiful organization.” He sees this capacity to build beauty as what differentiates humans from machines. The surface irony or apparent contradiction is obvious: three of the four principles do not immediately come to mind as ingredients of beauty or principles for building beauty. But listen to Leberecht and you may come away thinking otherwise. I always found a strange beauty in Albert’s presence; Leberecht’s principles give me some insight as to why. I also see in those principles the potential for a paradigm shift in how I view those institutions we have entrusted to care for many of our most elderly and infirm human beings. Do the Unnecessary: Skilled care centers are constructed, staffed, and operated to provide comprehensive care. In addition to medical care, this also includes providing and assisting with food, daily living activities, and self-care, and offering opportunities for recreation and worship. In many such centers, necessity keeps the staff pretty busy. What better place on earth to “do the unnecessary” than where so much is prescripted and proscribed! What can this look like? A guitar or piano serenade at lunch. Pets visiting in the hallways and residents’ rooms. Plants and aquariums and aviaries—living things that residents can love and care for. Ice cream served once in while at breakfast. Movie nights featuring Laurel and Hardy, The Three Stooges, John Wayne, and Audrey Hepburn. Nursing home staff for whom “smile and say hello” is rule #1. Regular visits to residents from neighborhood school children. Periodic visits by nursing home administrators and staff to homes in the neighborhood, inviting their neighbors to visit the care center and its residents. These are the building blocks of beauty. Create Intimacy: “What are relationships other than a string of microinteractions? There are hundreds of these every day in our organizations that have the potential to distinguish a good life from a beautiful one” and to build intimacy, says Leberecht. Constructed from “small moments of attachment . . . intimacy is the opposite of loneliness,” he says, attributing the insight to writer Richard Bach. Senior care centers have minimally three wonderful intersections of opportunity for creating intimacy: between staff and staff; between staff and residents; between residents. Anything care centers do to encourage such “small moments of attachment” at these intersections—this is the foundation of beauty. And maybe that last quote contains also a seed of potential beauty: belonging. To be isolated is to be told we don’t belong. The opposite? To be visited, befriended, touched, spoken to, listened to, acknowledged, respected, treated with dignity. Enter a nursing home or Alzheimer’s care unit where these are “best practices,” and you will not leave depressed or afraid. Visit a senior care center and practice these virtues yourself, and you also become an architect of beauty. Be Incomplete: Senior care centers provide a reflection of and a crystal ball to our own ongoing diminishment as we age. But these inevitable losses—physical, mental—ought not be denied or ignored. If we consider ourselves realistically, we are already thoroughly incomplete! So rather than perpetuate the charade, why not acknowledge and embrace the limits of our humanity? 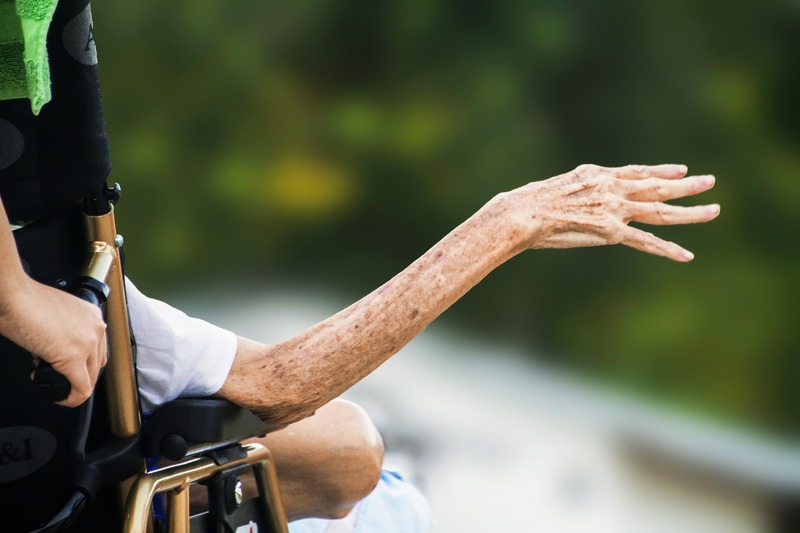 At a nursing home, the incompleteness we all share is on full display. Which brings me back to Albert. This lovely man had one “good” hand. With it, daily he undertook the unnecessary task of meticulously folding his dinner napkin with all the grace and precision of a Japanese tea ceremony. Albert had one phrase remaining to his use: “Too much for these times.” In that gesture, with those words, through the kindness of his eyes, he created an intimacy that dispatched our shared loneliness.